Cloudy. Becoming a mix of sun and cloud this morning. Wind northwest 20 km/h gusting to 40 becoming light near noon. High plus 4. UV index 6 or high. Increasing cloudiness after midnight. Wind becoming southeast 20 km/h overnight. Low plus 1. Cloudy. 60 percent chance of showers late in the afternoon. 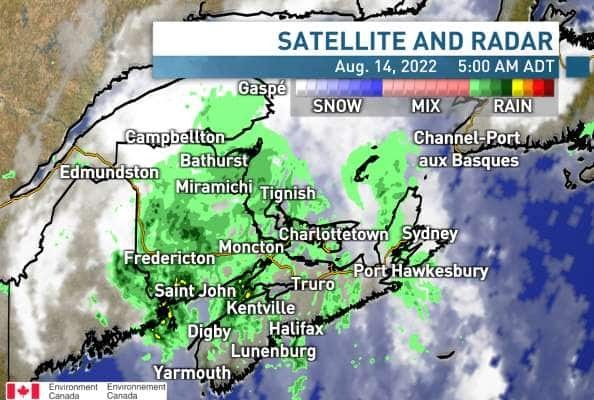 Wind southeast 20 km/h gusting to 40 increasing to 40 gusting to 60 except gusting to 100 from Margaree Harbour to Bay St. Lawrence late in the afternoon. High 10.